Ski House Address Sign - - If you're lucky enough to own a ski house, you can make it really special with this personalized ski house address sign. Surface mount on a wall, fence, or column. It's a Comfort House exclusive. Made in USA. Rectangle shape with radius corners. 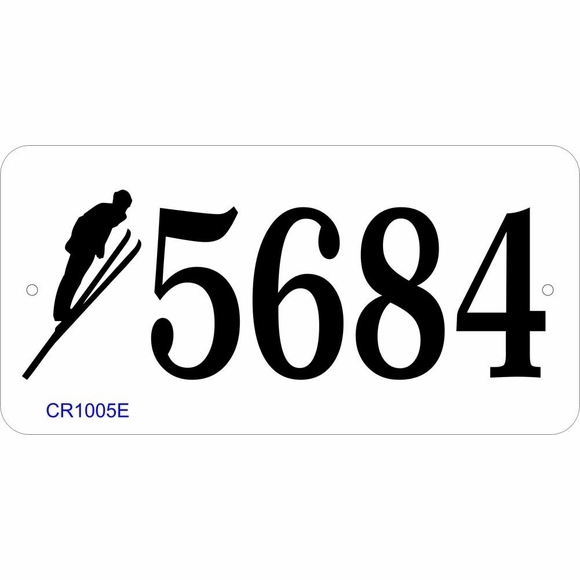 One-line address number plaque holds up to four (4) 3" numbers or letters and the ski theme image you select. Six skiing images available. Images A, B, D, and E are placed on the left side of the sign. Images C and F are placed on the right side of the sign. Note: the style number visible on the sample signs (in this case CRS1005) is for internal use only and is not on your custom sign. Dimensions (approximate): 10"W x 5"H x 1/8".